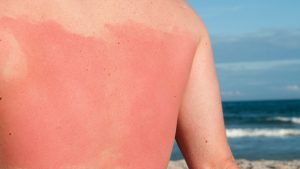 Sunburn occurs after the skin is exposed to too much UV (ultraviolet rays) from the sun. Continuous exposure to sun rays may lead to chronic diseases, such as melanoma (skin cancer). You can only prevent sunburns by protecting your skin when you are outdoors. All exposed parts of the body, including your lips, scalp and earlobes are susceptible to burns. Even eyes can burn since they are very sensitive to UV rays. After a few days, the body begins to peel off the damaged skin. Your skin will then have an irregular color and pattern after peeling, although this is temporary. Exposure to excess ultraviolet light leads to sunburns. There are various types of UV rays. The ones you should shield yourself from are the Ultraviolet A (UVA) and Ultraviolet B (UVB) types. UVA radiation is associated with skin aging, while UVB radiation causes sunburns. Both radiations have been linked to skin cancer. Sunburns can also be caused by tanning beds and sunlamps. Areas damaged by sun appear as whitish, brown, tan or pink scaly patches. These are precancerous lesions that may evolve to skin cancer. Skin cancer generally develops due to over exposure of the skin to sun, with or without sunburns. Too much UV radiation affects the eyes. Snow blindness comes as a result of the sunburn to the cornea. Avoid over exposure to the sun, especially between 10 a.m. and 4 p.m.